Welcome to the learning and burning city as it is known. It’s a cross between two worlds, a thriving city and an agricultural countryside where in the middle two rivers meet. Varanasi, a city of about 3 million people, is about 60 percent Hindu, 20 percent Muslim and a mix of everything else. Upon our arrival, our guide informed us that Indians need three things: 1.) A good horn, 2.) Good brakes and 3.) Good luck. I’m starting to think this is why everyone is so religious. Varanasi is the silk capital of India, which means what? It means Jill and I went shopping again. This time we succumbed to the silk gods both purchasing a table runner that functions as a scarf and I tagged on a silk screen “picture” that will be eventually hanging over the headboard I do not currently own in the home I do not presently live in. Before we got suckered into shopping, we did get a presentation on silks and saree making. Each wedding dress takes six months to make and contains roughly 1/2 kilo of silver sometimes painted with gold polish. There are approximately 30-40,000 people who work in the looming business in Varanasi. While machines have replaced people, they have not replaced the craftsmanship and detail that go into the fabrics made by hand. It takes a worker eight hours just to make one meter of a saree. After our brief digression, we informed our guide we wished to see sights and did not want to visit more shops. This commission business is a big deal and I understand that shopping is important but bring on the religion. Hinduism has four mothers: the Cow, the Ganga (The Ganges River), Mother (birth) and the Ground. At dusk, we watched an AMAZING ceremony called the Arti, where Sadhu’s (holy people similar to priests) and the local people paid homage to the Ganga from the Ghats(steps) leading to the River. A sadhu is a Hindu who has renounced caste, social position, money and authority. There were five Sadhus each situated on their own worship bed decorated with a conch, candelabra, marigolds, and a figurine of a god. Bells rung from above, a gong beat loudly and a drum intermixed somewhere in the madness. 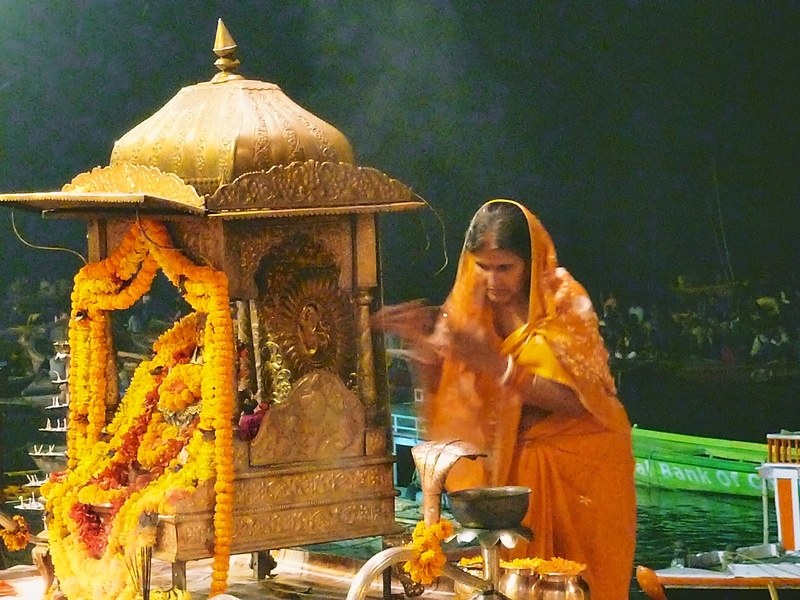 Thousands of people gathered at the river presenting offerings to the Ganga, while the Sandhus moved in a type of circle dance presenting their various gifts to the River. Locals and Jill floated marigold and candle pieces in the water as their personal offering. It’s said to give one the benefit of good Karma. There was smoke, fire, warmth, light, vision, belief, color and much symbolism in this performance. Local people attend this ceremony every night. It’s an energizing experience. Each morning thousands of locals bathe in the Ganga River before visiting the temples or returning home to begin their day. The procession starts each day around 6:30 am. Local Hindus dunk themselves in the holy water of the Ganga. Women wade in the water fully dressed, while men fully immerse themselves in the water removing all clothing but their underwear. I saw one man even shampooing his hair. The men and women bathe in separate. areas. Young girls and boys bathed with their mothers and fathers respectfully. This is a very powerful practice for Hindus and considered one of the most important religious events one can do. From our boat on the water, we also were able to see one of the largest cremation sights in India. It is said that people come to Varanasi to live and to die and that living in this city will give them rebirth. Hindus believe in cremation. Once a person dies, they must be cremated within 24 hours and then their ashes are scattered into the River Ganga. We could see the flame burning 50 feet high from our position on the water. Some tourists notice a distinct smell but I could only recognize the ashen Temple behind the crematory that was clearly burned/ashen from years of processions. Women are not allowed to participate so only male family and friends attend the ceremony. The bodies are carried on a type of ladder / stretcher from the home to the crematory. We also had an opportunity to wander the narrow streets of old Varanasi, which are filled with makeshift temples, locals eating, old very rundown homes, cows, water buffalos and dogs. One buffalo parched near an alleyway saw me a mile away and starting trotting near me. It was a sign for me to get the heck out of the way. I just cannot comprehend how cows, buffaloes, dogs, cars, motorcycles, bikes and people all share the SAME streets.